Posted By:Unknown | At:12:35 PM Be the first to comment! Prosecutors said a website Zimmerman created for his legal defense had raised $135,000 at the time of his first bond hearing. Zimmerman and his wife did not mention the money then, and Shellie Zimmerman even said the couple had limited resources because she was a student and he wasn't working. The judge made his decision after listening last week to Zimmerman's attorney and a forensic financial analyst explain why he wasn't more forthcoming. The judge expressed his unhappiness with Zimmerman and said that his actions suggest a possibility that he was preparing to flee to avoid prosecution. Zimmerman's attorney Mark O'Mara sparred with prosecutors over those finances last week and questioned why his client is in jail at all, arguing that Martin's actions led to his death. O'Mara ultimately decided against calling his client to the stand during last Friday's hearing, unlike during the first bond hearing, when Zimmerman apologized to Martin's family. The defense attorney called Zimmerman's father to testify, and played a chilling 911 call from the Feb. 26 night when Martin was killed. The call includes a disputed cry for help and the fatal gunshot. Robert Zimmerman said he was sure that was his son's cry. Zimmerman has been charged with second-degree murder for fatally shooting the unarmed 17-year-old Martin on Feb. 26 at a gated apartment community in Sanford. Zimmerman has pleaded not guilty and claims the shooting was self-defense under the state's "stand your ground" law. 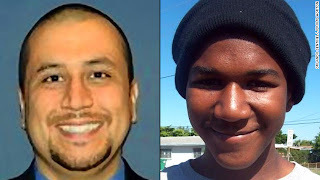 Martin's parents and supporters claim that the teenager was targeted because he was black and that Zimmerman started the confrontation that led to the shooting. Zimmerman's father is white and his mother is Hispanic. The 44 days between the shooting and Zimmerman's arrest inspired nationwide protests, led to the departure of the Sanford police chief and prompted a U.S. Justice Department probe.